United Launch Alliance provided a live webcast of Saturday’s launch from the Vandenberg Air Force Base in California, Trend reports citing Sputnik. 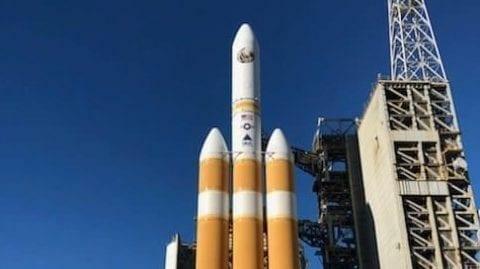 The classified NROL-71 mission for the National Reconnaissance Office was set for takeoff in early December 2018 but was pushed back several times over technical glitches and poor weather. The NRO is responsible for the nation’s fleet of reconnaissance and intelligence-gathering satellites. The launch provider announced the liftoff shortly after 2 p.m. EST (19:00GMT), jettisoning its solid rocket boosters several minutes later. Live streaming coverage was wrapped at the request of the customer. US President Donald Trump, during a speech at the Pentagon earlier this week, unveiled a 2019 US Missile Defense Review (MDR), a strategy calling for a boost in land- and sea-based missile defense systems in Europe and the Middle East, along with a study to develop space-based interceptors. The document said the US plans to deploy a new missile defense radar system in the Pacific region by 2025. The review also states that Washington will strengthen regional missile defense architectures in the Indo-Pacific, Europe and the Middle East. According to the MDR document, the US will explore space-based interceptors as a means of engaging with offensive missiles in the boost phase in order to increase missile defense capabilities. The new review also pushes for developing a layer of space-based sensors to enhance US capabilities to detect and track more complex missile threats.